We woke up super-early this morning – no sunday lie-in for us! By 8am a pork shoulder was dressed and having a lovely tanning session in the slow cooker, the coffee beans were ground and an 8-cup cafetiere was put into action, and sour dough starter was developing nicely. So we then decided to walk in the lovely sunshine t0 the gym for a swim. You probably know the feeling at 11am when you aren’t sure whether to skip breakfast and wait for lunch or have breakfast and a much later lunch, well frankly I was starving and when the other foodie suggest an old time East End cafe I wasn’t impressed. I love cafes but I’m very fussy when it comes to breakfast and especially picky when it comes to an E17 traditional breakfast. 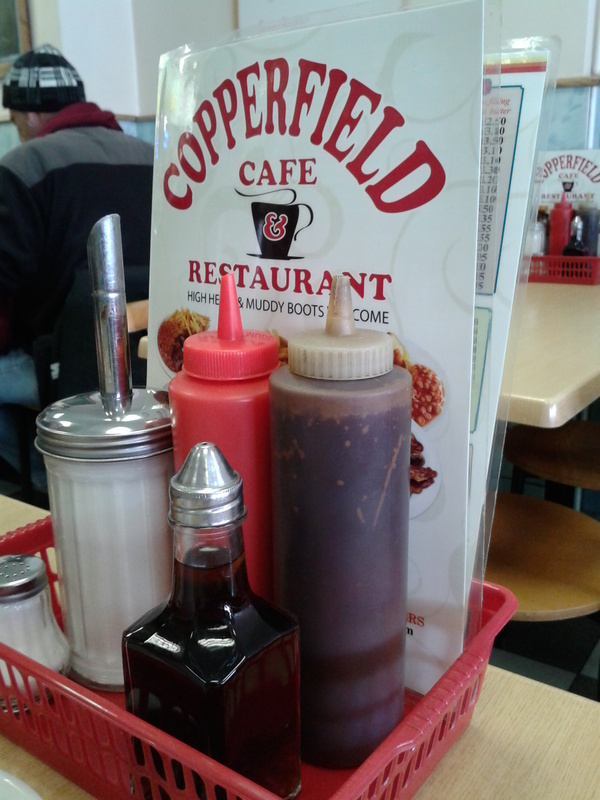 After a bit of pursuasion (along the lines of … you’re just grumpy when you’ve not been fed) I agreed to the Copperfield Cafe on the High Street as we were on our way to the Farmers Market. I was intrigued to see that they have salt beef as a special on the menu, so I went for the hot salt beef salad as I knew the pork was happy basking at home for a few more hours. 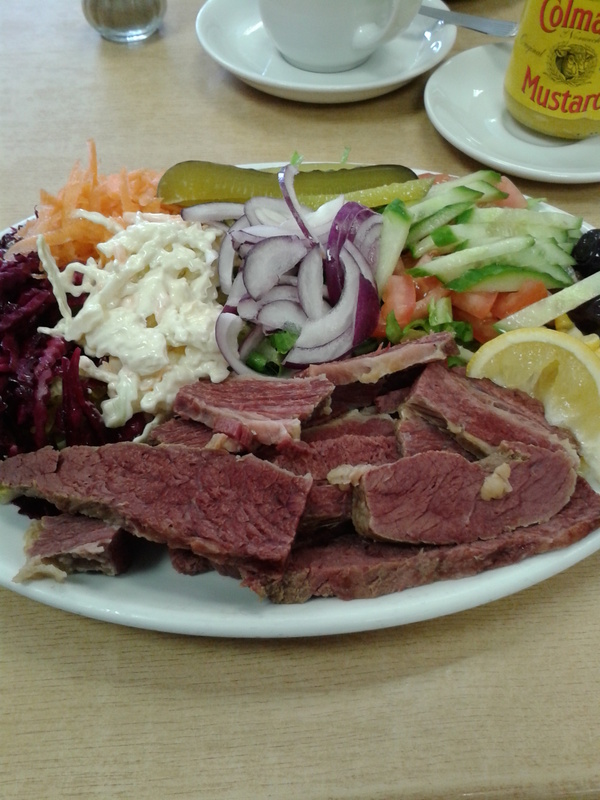 What arrived was a plate of salad and lashings of salt beef which at £5.50 was really good value. Every salad ingredient was on the plate – sweetcorn, lettuce, red cabbage, sweet gerkins, lemon, tomatoes, cucumber, olives. This was paradise for me a carb-free breakfast – and hey no cheap white bread! The salt beef was moist and tasted great with mustard. The other foodie stuck to poached eggs on brown toast – but I think we’ll both be back for the salt beef in the near future. 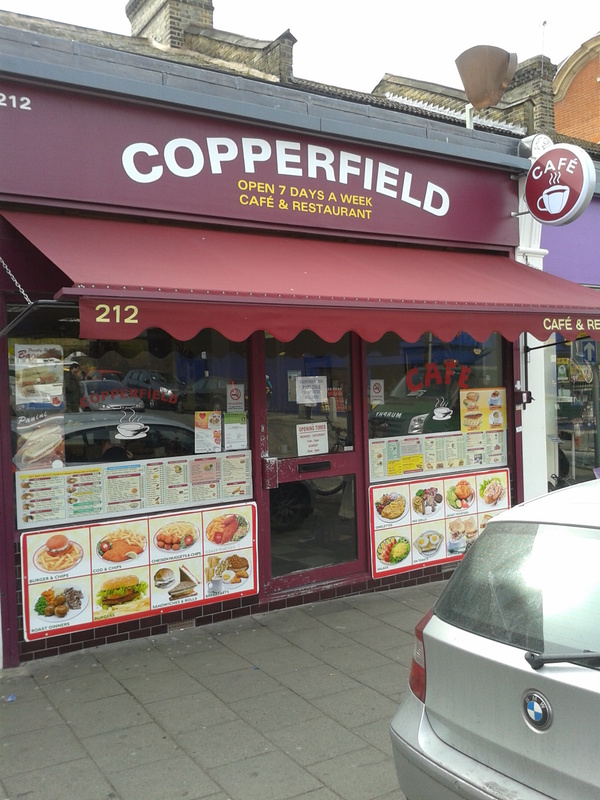 They also do the standard fry ups, Turkish breakfast and homemade pies and with 5 out of a 5 in their food hygiene standard scores – another reason to support the E17 local cafes. High heels and muddy boots welcome! This entry was posted in Cafes, Restaurants in E17 and tagged Beef, Breakfast, Brunch, Copperfield Cafe, Hot salt beef, Salt beef salad. Bookmark the permalink.